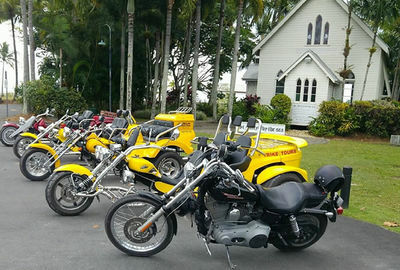 Locally owned S & S Personalised Trike Tours - a unique way to see the area. With 2 Trikes it's a unique way to see the area with family or friends. Scenic tours around Port Douglas, see the awesome views from Flag Staff Hill , 4 Mile Beach or Saint Crispin Station. What about a cruise through stunning Mowbray Valley and Spring Creek. Airport Transfers, Mossman Gorge, Mt Molloy, Daintree Village full day trips also available. Feel it, smell it, touch it. The best tour experience by far as you feel it! All ages welcome except for kids under 5 and disabilities are catered for. Shaun does Cairns airport pick ups and drop offs, with the handy trailer your luggage can travel with you too. S & S has two 2 seater Trikes but can also look after large groups with a combination of Trikes and Harley Davidson motorcycles. Shaun has compiled packages for you to choose from or you can make up your own. Packages include tours to great destinations like High Falls Farm exotic fruit farm and restaurant, a pamper package up in the hills, feel the ocean breeze on a cruise to Ellis Beach... Check out the views from the top of the Rex Range... See the Daintree or your choice of destination... Short or long trips... From 30 minutes to a full day! We have local cultural knowledge. It's your adventure, you decide.